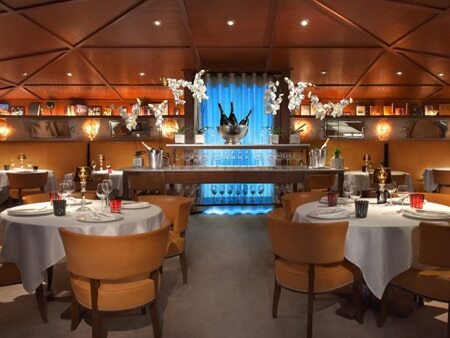 At this intimate, luxurious space inside The Bazaar, guests enjoy a fine dining version of chef José Andrés’ cuisine. 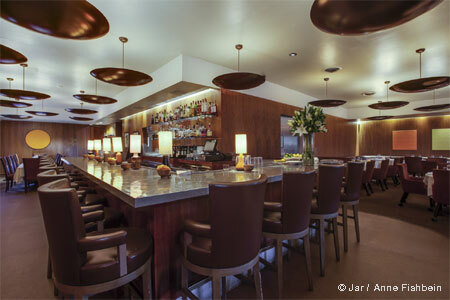 For a photo tour of the SLS Hotel at Beverly Hills, read GAYOT.com's blog. : SAAM CLOSED AFTER SERVICE ON JULY 29, 2017 ---- This very elegant, quiet dining space hidden within The Bazaar has its own distinct identity. Chef José Andrés likes to call SAAM, “the tasting room.” Removed from the clamor, it is the perfect place for an intimate dining evening for romance or business. The décor, also done by Philippe Starck, is completely different from the rest of the hotel with beige tones, a wood ceiling, turtle shell-like glass sconces and walls of books on display. The menu concept is simple: $150 for twenty-two courses that are already established (unless you have food allergies). You cannot choose, but must trust the chef’s creativity and presentation skills. Of course, no two productions are ever the same and each of the twenty-two tasting portions is completely different from one to another; it is a discovery every single time. We feel we should keep the surprise and give you only straightforward descriptions of what to expect. Most of the ingredients are classic, like artichoke, asparagus, caviar, olive oil, chicken, sea urchin, arctic char or tournedos Rossini, and chocolate; but the execution is like no other, making Andrés’ cuisine absolutely unique. The globe-trotting wine list is divided by “Grapes,” “Places,” “Grand Vintages” and “Producers & Persons” for easy navigation to categories of interest. Specialty waters and wines by the glass and half bottle are also available.